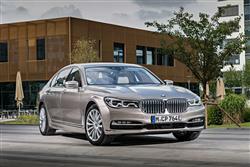 Find out everything you need to know on the new BMW 7 Series from independent vehicle review website Car And Driving. You can watch the video review to the left to see more of the car or read their written review below to get a true insight from an expert in the automotive industry. With this sixth generation BMW 7 Series, evolution has been the name of the game on the outside, but there's revolution afoot beneath the skin. Boasting greater efficiency and even more luxury than before, can it finally topple Mercedes' S-Class? The experts at Car & Driving check it out. Longer, taller and better equipped yet up to 130kg lighter than before, the MK6 model BMW 7 Series has had to get clever to keep up with the demands of the marketplace. With a frugal diesel and a plug-in hybrid available, it proves even luxury barges need a conscience these days. BMW's 7 Series has been with us four decades now, with the first generation car having gone on sale back in 1977. Initially available in one length with a six cylinder engine, a V12 was offered back in 1987 on the second generation car, with a long wheel base model available too. As the Nineties became the Naughties, increased environmental concerns saw the introduction of diesels for the UK market as the list of available equipment grew along with the car's size and weight. For the sixth generation car, BMW knew they had to not only offer even more interior room and on-board gadgetry but also put the car on a crash diet. Through the use of carbon fibre, the Bavarian marque has been able to deliver on the conflicting demands of less weight but more kit, including firsts such as a four wheel steering system. As a result, this should be the best 7 ever. The 7 Series has always sold itself as the driver's choice in luxury limos and that doesn't look to be changing any time soon. There's now, for the very first time, a four cylinder engine option, the 2.0-litre 231bhp unit you'll find in the entry-level 725d variant. If nothing but at least six cylinders will do, you'll find that even the most sensible (and slowest) six cylinder 730d pumps out 265bhp, enough for 0-62mph in a scant 6.1 seconds. BMW's xDrive 4WD system is an option on this model - and you have to have it if you opt for the pokier 320bhp 740d, which makes the 62mph benchmark in 5.2s. The petrol range starts with the 326bhp 740i model and progresses to the 449bhp V8-powered 750i which makes 62mph in just 4.7s. At the top of the range is the 6.6-litre V12 610bhp M760Li xDrive variant, ideal if you really want to sack the chauffeur. Should you want to be as green as possible - or just escape the London congestion charge - there's a 326bhp 740e plug-in hybrid that can travel up to 25 miles on electric power alone. All models receive an eight speed automatic gearbox and air suspension for both front and rear axles that allows you to switch from soft to sporty and the touch of a button. As the ultimate party trick, you can even get out of the car and set it to park itself from your smart phone. Very James Bond. BMW have learned a lot regarding the use of carbon fibre from their electric i3 and i8 models; the 7 Series is the first mainstream BMW to benefit from this. Although steel is still at the core of the car's structure, carbon fibre reinforced plastic is used to help add strength and reduce weight. To further assist, a greater amount of aluminium is used for suspension componentry to cut 200kg from the rolling chassis. The addition of an extra 70kg of equipment brings this weight loss down to a maximum 130kg however. Outside the changes are far less dramatic. The latest and largest version of BMW's kidney grille sits up front with the headlights (LEDS as standard, with laser lights as an option) flowing from this. Although the shoulder line has been sharpened up, changes to the rear screen and boot area make the car seem sleeker overall. Inside is plusher than ever with a fifth generation iDrive system and even greater connectivity for your mobile devices. For the first time, there's also a gesture control system that uses a 3D sensor in the headlining to interpret your swipes, pinches and rotational movements to control a variety of functions. With the 7 Series acting as BMW's flagship saloon, it's no surprise that you'll have to dig deep to afford one. The range kicks off with the standard length and specification 725d at around £62,000. If you're after maximum rear legroom, the long wheelbase 'L' chassis is nearly £4,000 more. Stretch up to around £65,000 for a six cylinder 730d and you get the option to pay another £3,000 or so for xDrive 4WD. If you want to avoid the black pump, the petrol range starts at approximately £70,000 for the Plug-in 740e - or around £73,000 for the more conventional 740i, which only comes in long wheelbase form. Those that want a harder, more aggressive edge will want the M Sport trim at another £4,000 to get a racy bodykit and interior flourishes. If luxury is your game, the 'Design Pure Excellence' package is the trim for you thanks to additional - yet tasteful - chrome trim plus extra wood inside. Alternatively for those with the deepest of pockets, there are 'Individual' models that give the maximum of customisation options. Still, even the lowliest variants get leather seats, four-zone climate control, a Bluetooth infotainment system with sat nav, wireless phone charging, a rear view camera and auto headlights and wipers. Safety is covered by wall-to-wall airbags, advanced ABS and stability control, brake assist, anti-whiplash headrests, run-flat tyres and even heated washer jets. Just because you're spending £65,000 on your luxury automobile doesn't mean you'll be paying through the nose to keep it on the road. Even the 740Li with its turbocharged petrol six is capable of between 41.5mpg on the combined cycle, while emitting 159g/km of carbon dioxide. Those carbon emissions are better than a number of hot hatchbacks, a great achievement considering the size of the engine and weight of the car. Benefit in kind is 26%. Naturally the consumption champion here is the plug-in petrol/electric 740e, which manages a CO2 return of just 49g/km. The more conventional entry-level four cylinder diesel model, the 725d, manages 61.4mpg on the combined cycle and 122g/km of CO2 in its standard shape. The volume six cylinder diesel 730d posts a 60.1mpg figure, plus a CO2 return of 124g/km. Long wheelbase models add 3g/km, 1% to BiK and reduce fuel consumption by a little over a mile per gallon: not too shabby at all. It's xDrive that gives a bigger hit to economy, knocking nearly 4mpg off the rear drive model and adding 8g/km of carbon emissions. Even so, these are figures that a supermini would have been proud of not long ago. To think a saloon of such stature could managed them is impressive stuff. The 7 Series has always offered a slightly different take on the large luxury saloon. Although other vehicles may arguably offer greater passenger comfort, the big BMW has always made sure its drivers could enjoy themselves should the fancy take them. With this MK7 model, BMW look to have improved on this dual personality with the latest in switchable suspension tech and cutting edge carbon-enhanced construction. You could argue that the seventh generation model doesn't look different enough to the old version but then this is quite a cautious section of the market. It's also undoubtedly better looking than the old car, managing to seem both more stately and athletic at the same time. Whether it's enough to edge out the BMWs arch nemesis the Mercedes S-Class is another question though. You'll enjoy deciding.